Did you know that little things can greatly empower your customers? Did you know they like that? Guess what, they do. (Well, not him, but he's a little **&^*#@$*& anyway.) 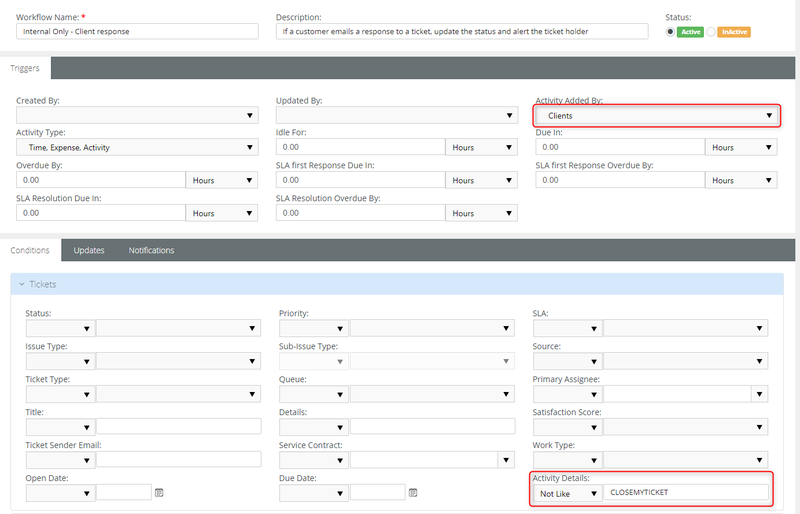 Use the Workflow rules in Kaseya BMS to empower your customer by simply sending you an email. 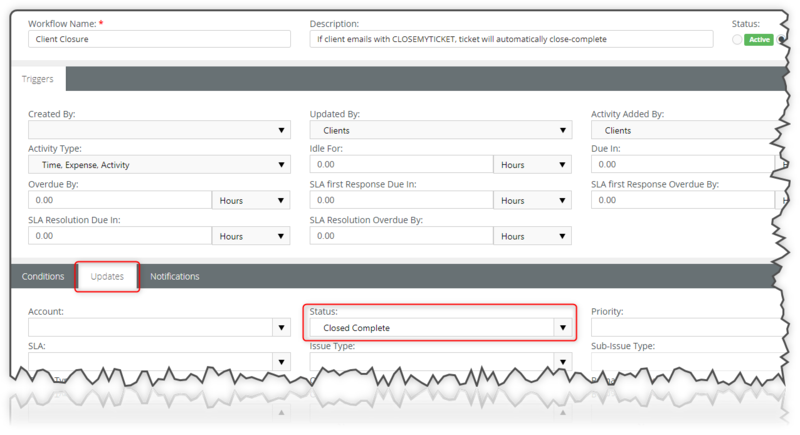 Workflows are ways to automate parts of your work processes for your tickets. By analyzing the items that come in (and out) of BMS, you can get people's attention, forward on reminders, even remind them of things they may have forgotten. 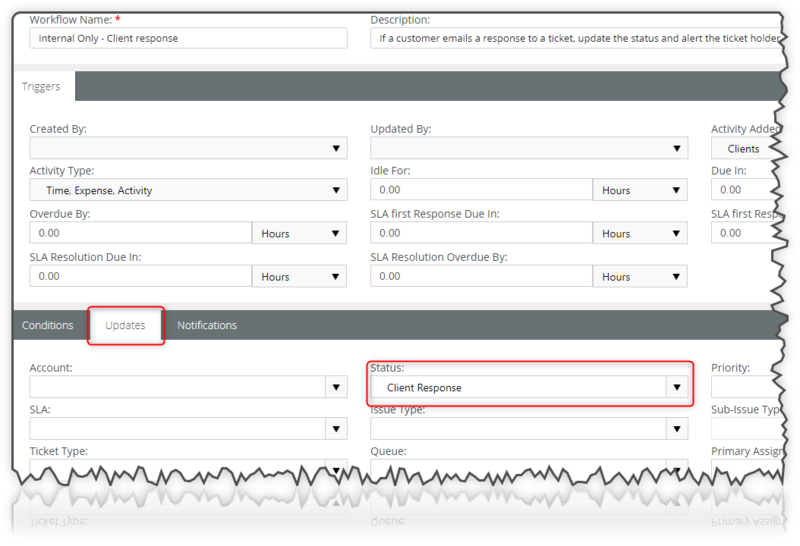 This quick example shows you the settings for 2 workflows initiated by your customers emailing to your support desk email address. Articles and/or training will be forth-coming on these subjects. Here's where you can empower your customers, and save yourself some time as well. 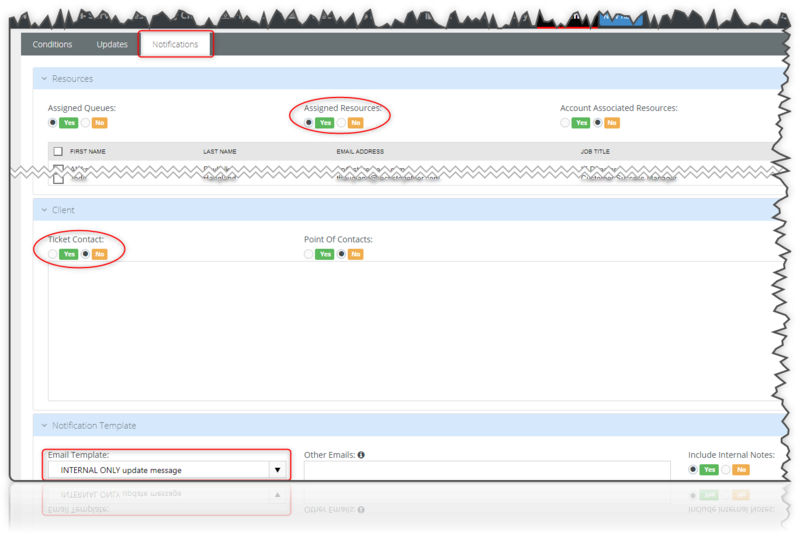 By enabling a keyword in an activity, you can trigger a specific workflow action, separate one message from another, and have different actions happen. The keyword should be pretty unique, shouldn't it? If you used "close" then the wrong action could occur is someone's "laptop is close to death." So let's try CLOSEMYTICKET. There isn't much misunderstanding that, is there? 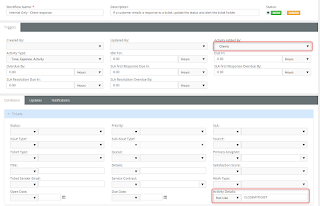 The conditions placed here means that a) an Activity created by the client, b) the ticket is in status Waiting for Client, and c) includes the phrase CLOSEMYTICKET. (case-INsensitive). As a courtesy, I've added a paragraph to my correspondence in all outgoing messages using a Note Template that gives this information to the client. Think of this Note Template (found under Home - My templates) as a signature added to your correspondence. Now this is how the action gets triggered, but what action do we take? All we really need is to update the status to a "Closed" one. 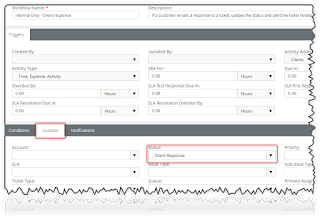 As a courtesy, you could send an email notification to the Assigned Resources and / or the Client as Confirmation. This isn't the only reason that a client will reply to a ticket, however. In most cases, tickets go back and forth between technicians and clients to gather necessary information, test out solutions, and verify everything is working. 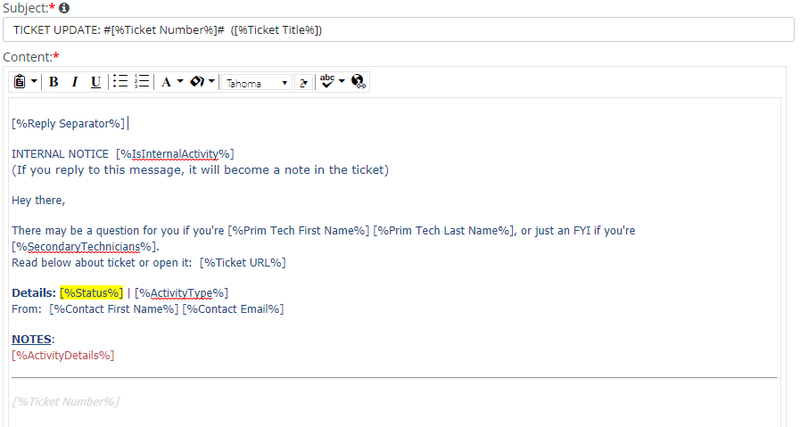 People don't always "live" in the ticketing portal. They'll not see updates on a tab in their browser when they have 3 dozen tabs open. But email notifications are everywhere. Even if they're in the car. 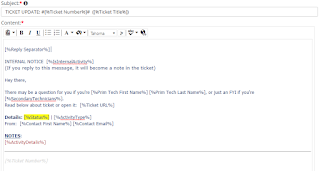 So have the important updates to a ticket update the status and send an email to the right personnel. Don't confuse this action with your Auto-close action! Note that there is a specific Email Template for this Notification. This will format the email. 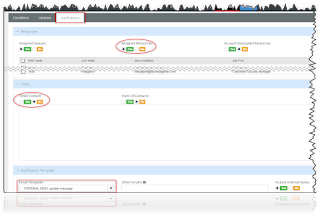 You can use several different variables to help increase the visibility as well as usability of the message that gets sent. As mentioned, we'll talk more about Email Templates and other subjects in other articles. 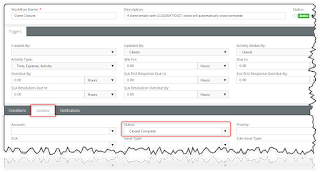 Of course, if you look at the conditions that are available, there are several other things you could do with a workflow to improve working habits and save personnel time. A good example is closing a ticket if the client is satisfied, but probably forgets to tell you about it. Idle time is how long a ticket has sat in it's current status with no Activity of any type. Obviously there are other flows that could be done. Leave a comment about one you think useful, or one you'd like to see written about below. Automation ... what drives the efficiency of true business. My thanks to Adam Bovan (Singularitee Limited) for his help in developing this article. *You could have more scenarios that may require different or additional conditions; if you use Tickets in Sales for instance; there could be a situation where a client replies requesting information that may require a different status be applied that Sales uses vs. Service & Support personnel.